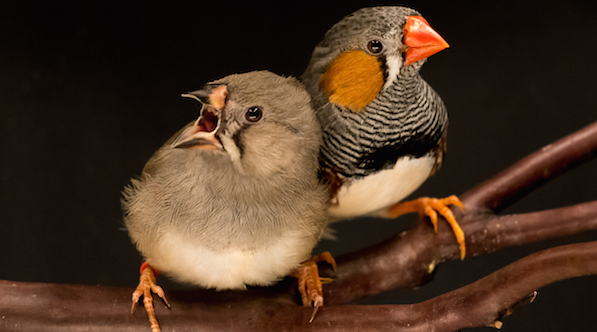 A study details the motor-neuron mechanisms that underlie learning and singing in zebra finches. In the long list of classic martial arts movies, no phrase is more iconic than “wax on, wax off,” from The Karate Kid. With those words, Mr. Miyagi leads his student Daniel in a long, seemingly pointless string of small movements. Only much later in the movie does Daniel realize that these motor actions, when practiced to perfection, can be connected to sophisticated karate maneuvers. We acquire the skills for many of our daily activities in a similar fashion. Whether we drive a car, ride a bike or play the piano, all of our movements, however elaborate, consist of strings of simple motions. Little is known about the changes in our brains that enable the emergence of complex behaviors during the course of learning. A recent study published in Nature by Michale Fee’s laboratory at the Massachusetts Institute of Technology (Okubo et al., 2015) used the songbird to provide a powerful description of the alterations in brain activity that occur throughout the process of motor learning. (Fee is also a Simons Collaboration on the Global Brain (SCGB) investigator.) Specifically, the team recorded the activity of certain neurons in young zebra finches and documented how their neural patterns split to form duplicate patterns, a process that ultimately enables the bird to master complete songs within a limited learning window. In the zebra finch, the key area for song production is the forebrain nucleus HVC, which contains cells that project to motor neurons that ultimately control the physical aspects of singing. Different HVC premotor neurons elicit bursts of action potentials at different times during the production of a song, and together these bursts form a neural sequence (Hahnloser et al., 2002). When the bird has fully learned its song, every premotor neuron generates at most one burst during the song at the same point in time relative to the other bursts. Thus, neural activity is ‘sparse’ during song production. The neural mechanisms underlying the development of the sparse neural sequence to generate full singing behavior had not been shown, however. In an attempt to understand the mechanism for these sequences, researchers developed theoretical models to explain the propagation of sequential neural activity by simulating neural sequences as a synaptic chain — that is, one group of neurons is activated, and it excites the next group of neurons, and so forth. Synaptic chain models represented a first step toward the understanding of neural-sequence generation, but because the models were based on hard-wired structures, they were unable to explain the process of song learning, which requires more complex neural plasticity. To explain the neural plasticity that’s necessary for learning, Ila Fiete of the University of Texas at Austin (and an SCGB investigator) pioneered a theory of HVC activity (Fiete et al., 2004). Building on the discovery that HVC neurons burst once during a song (Hahnloser et al., 2002), Fiete hypothesized that HVC activity is already sparse in young zebra finches, just as it is in adults. Zebra finches have to learn their song within a critical period of 90 days, and thus learning speed is important. Fiete’s model incorporated the need for speed and predicted that non-sparse coding would hinder the learning process. The reason for this is that a more complex code — one with more bursts — has more possibilities for diverging from the neural sequence underlying the actual song: There are more ‘wrong paths’ to take. Instead, Fiete and her collaborators suggested, sparseness is a fundamental property that facilitates rapid learning. More recently, Fiete (Fiete et al., 2010) and the group of Dezhe Jin (Jun and Jin, 2007) refined this approach and developed models that apply synaptic plasticity rules — rules that govern how synapses strengthen or weaken over time and thereby enable neural networks to learn. Fiete’s team in particular proposed a rule that adjusts the connection strengths between neurons according to the relative timing of bursts of individual HVC neurons during singing. They also applied a process called heterosynaptic competition, in which the activity of a specific neuron leads to changes in synaptic connections between another pair of neurons. These new modeling approaches proved helpful in experiments because they provided clues on what to expect in the data, says Tatsuo Okubo, a former MIT graduate student in Fee’s laboratory. In a technical tour de force, Okubo recorded more than 1,100 HVC premotor neurons in 35 juvenile zebra finches during different stages of vocal learning for the MIT study. After hatching, juvenile birds listen to the vocalizations of their parents and then produce a subsong, a nonstructured, sloppy vocalization that can be thought of as similar to the babbling sounds of infants. During this stage, the researchers observed that HVC premotor neurons produced nonrhythmic bursts that progressively became more rhythmic. Moreover, bursting activity in HVC was sparse from the beginning, as predicted by Fiete. 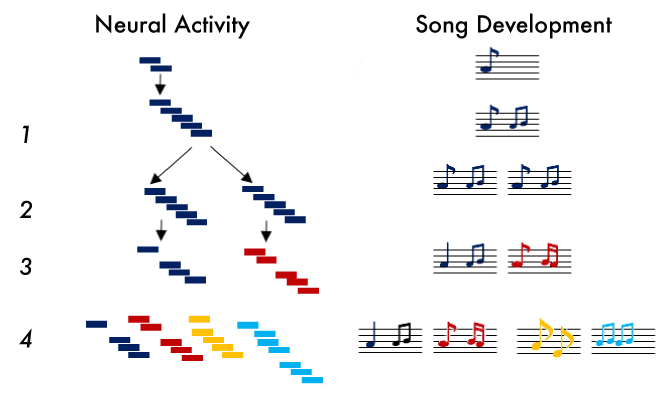 Over time, juveniles started to produce a rhythmic song segment called a prototype syllable, or protosyllable — an identifiable rhythmic precursor to the fully formed syllable, analogous to the first simple syllables babies speak, such as “ma” in “mama.” The researchers noticed that most HVC premotor neurons participated in the neural sequence that produces the first protosyllable. Early on this sequence spanned only the beginning of the protosyllable, but it eventually grew to encompass the entire protosyllable. How does the neural circuit manage to convert from a setup that generates just a single syllable into a system that can produce multiple distinct syllables in a complex motif? To answer this question, Okubo measured HVC premotor neuron activity in juveniles that already produced multiple syllables. He found that the original neural sequence used for the first protosyllable is repurposed (or duplicated) to produce a new protosyllable, in much the same way that Daniel learns to repurpose his “wax on, wax off” moves into a defense against an opponent’s blows. Duplication also plays an important role in biological evolution: Genes duplicate and generate new genetic material through individual mutations of the duplicate. That the motor circuit applies a similar strategy had never been experimentally observed before. The duplication process facilitates the learning process tremendously: New ‘daughter’ segments do not have to be learned from scratch but rather can result from a splitting mechanism that recycles the previously learned sequence. Small step-by-step mutations of the duplicated sequence might lead to the production of a new syllable. This process appears to occur repeatedly until every syllable is represented by a neural sequence and the bird is capable of singing multiple syllables. With further analysis, Okubo, Fee and their colleagues observed that the phenomenon of neural splitting of the prototype sequence into daughter neural sequences can perfectly predict learning strategies of individual birds. For example, one bird created a new syllable by adding a short note to the beginning of the first protosyllable. In this case, the neurons first shared their activity across the two syllables, generating almost identical sequences. Later in development the number of shared neurons decreased, and the neurons produced syllable-specific activity. This finding indicates that the duplication process can be directly linked to the way birds learn their motor sequence. The results offer a broad lesson on the power of combining theory and experiment. The MIT team’s findings support the main predictions of Fiete and Jin that HVC uses a sparse code in early development and generates multiple neural chains to produce a motif. The data also support the notion that a subset of neurons (what the Fee team calls seed or training neurons) exists to receive external input that triggers neural sequences. The new study not only advances our knowledge of the emergence of neural sequences during motor learning but also represents a success story of interdisciplinary research. Exceptional theories are often guided by experimental evidence, and likewise, as this study demonstrates, experimentalists greatly benefit from the guidance of theory. Daniela Vallentin is a postdoctoral fellow at the New York University School of Medicine, in the lab of SCGB investigator Michael Long. Fiete IR, Senn W, Wang CZ, Hahnloser RH. Spike-time-dependent plasticity and heterosynaptic competition organize networks to produce long scale-free sequences of neural activity. Neuron. 2010;65(4):563-576. Hahnloser RH, Kozhevnikov AA, Fee MS. An ultra-sparse code underlies the generation of neural sequences in a songbird. Nature. 2002;419(6902):65-70. Jun JK, Jin DZ. Development of neural circuitry for precise temporal sequences through spontaneous activity, axon remodeling, and synaptic plasticity. PLoS One. 2007;2(8):e723. Okubo TS, Mackevicius EL, Payne HL, Lynch GF, Fee MS. Growth and splitting of neural sequences in songbird vocal development. Nature. 2015;528(7582):352-357.